Mount Shasta towers over the tent tonight. Though my fire crackles some 7,500 feet up her slopes, it makes a small light only halfway up the great, sleeping rock. 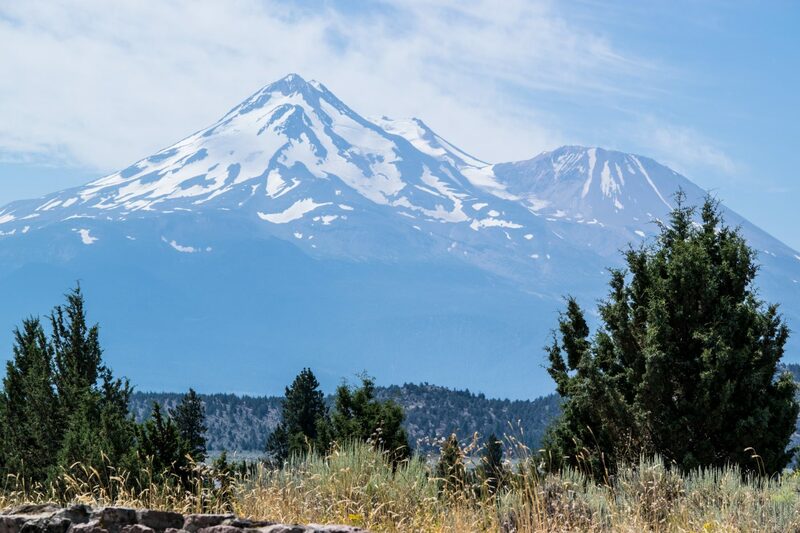 I say sleeping because Shasta is officially a “potentially active” volcano, and great because anything that can be seen 100 miles out probably deserves the nod. You know—the nightlong escapade to turn a string of bad luck into a stroke of good fortune. The dark forests of Oregon are behind; Mount Shasta and the golden land of California are the present and the future. Best of all? This view is completely free. Some of you have asked me how I’m funding this trip. “It looks expensive,” I’ve heard. “I wish I could afford to do that,” another told me. Panther Meadows Campground is home for the night. It’s probably the finest campground I’ve been to on the entire trip so far. I’ve got a picnic table, stone fire pit, grille, epic view and an outhouse nearby. And, it is completely free. Most campsites that you find are not, especially those in national parks, but the fees are typically $10-$22 per night. In other words, you get about a week worth of camping for the price of a one night stay in most decent hotels. Scope out apps like The Outbound to find adventure and campsite ideas in your area. If you’re planning a far-off vacation, you can search in that region as well. I found tonight’s campground, and several others, on The Outbound. Pack a cooler, and not just for drinks. Sandwiches and fruit are a lot more cost effective (and probably more healthy) than blowing a fortune on fast food or restaurants. This goes double if you’ve got kids. Google, Google, Google. There’s a reason that all hell broke loose when my phone went down yesterday. I’m using Google to find free campsites, campsite reviews and directions to the sometimes off-the-grid locations all day long. Fair warning: Apple Maps sent me down what I’m almost certain was an ATV trail today thanks to an automatic re-route to a trailhead. Always look at the satellite image if you think your path may go off road, and even then, use caution. Get smelly. You’re going to sacrifice creature comforts when you save cash. I used to take two hot showers a day. Now, I settle for one of any temperature about every four days. Hey…this trip isn’t about smelling good or looking great, it’s about seeing what needs to be seen. Embrace your inner road warrior. Lingering is the enemy of your bank account. By maximizing my time in each location, I’m able to quickly hop from spot to spot without spending extra cash on camping permits or fees at each stop. Buy an annual national parks pass. National parks cost an average of $25 per vehicle to enter. An annual pass costs $80, covers two people and entrance to every park in the system. But wait, there’s more: the pass also covers entrance fees for Bureau of Land Management, Department of the Interior, U.S. Fish & Wildlife and U.S. Forest Service lands. In other words, it’s a VIP pass to just about any federal land that you could camp on. My pass paid for itself before the first week was out. Even if you do all of these things, there’s no guarantee that everything will go smoothly. But, if you’re prepared for adversity…and if you handle it with a positive attitude while it’s happening, you’ll be just fine. There’s a world out there that you can see, and the great secret is that you can do it without breaking the bank.